Mayfair Granite have been fitting high quality granite and quartz worktops, throughout the UK for over 25 years. Our nationwide fitters are highly efficient and are able to provide you with quartz or granite worktops in Preston quickly and professionally, offering a highly personalised service, keeping you up to date along the way and fitting an impeccable kitchen worktop every time. Choosing a supplier for bespoke granite worktops online is always difficult, with so many different companies to choose from. In our case we were lucky to receive a recommendation from a friend, who had used Mayfair Granite and we were not left disappointed by their quality and service, from start to finish they were professional. I have to say Mayfair Granite have been very helpful from when I first made contact right up till the day of installation of my new granite worktops. I cannot fault any aspect of their service, quality or product. Well done Mayfair. Me and my brother both bought granite worktops from Mayfair Granite. Both without any regrets, would use again if I ever move apartments. 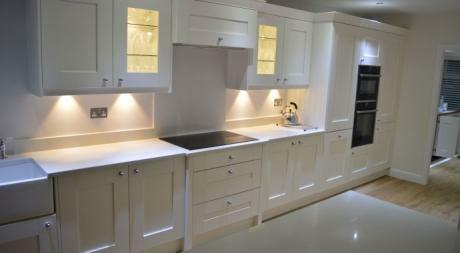 Thank you for helping us to select our quartz worktop, it looks fantastic. Danny who came to measure up and fit the tops was a great guy, pleasant and professional. We both are very pleased with the product and service supplied. We work closely alongside our expert templaters and fitters to make sure your worktops are tailored to suit your every need. With our large customer base in the Preston area, we are able to provide a 5-7 day turnaround from when the templaters visit and take measurements of the worktops, to actually coming and fitting the worktops, making sure the customer is 100% happy every time. Additionally, our highly trained stonemasons can template the worktops at any time preference to ensure you are present and able to advise you on the best options of fitting. The same stonemason will fit the granite, allowing the extra satisfaction that this will be done to your desire. Our bespoke granite and quartz worktops are tailor made, being measured, cut and polished in our workshops in the UK with high precision equipment guaranteeing the perfect cut every time. Our skilled team of professionals are well experienced and have provided worktops for the food industry, companies within the retail trade and end consumers. If you are looking to have a professionally installed quartz or granite worktop in the Preston area, be sure to contact one of our experts on 01772 284 472 who will be more than happy to answer any concerns, queries or a provide a quotation. We also have a free online quotation form that provides an instant quotation for those looking to compare costs.